This question teeters on that fine line, familiar to us here at the Straight Dope, between intriguing and ludicrous. Before anyone rushes to judgment, be aware that at least one other person had the same brainstorm as Ted. His name? Ben Franklin. So, you might want to hear this one out. 2. “His object is not taken from his view by the smoke of his own side.” Also true—prior to innovations of the 19th century, visibility was a major issue for armies exchanging gunfire. 3. “A flight of arrows, seen coming upon them, terrifies and disturbs the enemies’ attention to their business.” This falls into the true-but-so-what category. A storm of incoming arrows let fly by massed archers was undoubtedly terrifying. On the other hand, the din of musketry and cannon fire, the sight of a line of men cut down like weeds and strewn maimed on the ground ... that was also pretty distracting. Guns may not have been too accurate in the late 18th century, but they delivered plenty of shock and awe. 5. “Bows and arrows are more easily provided everywhere than muskets and ammunition.” Here’s where Franklin starts to go astray, although it’s easy to see why he might think this. At the time he wrote, the colonies had few gunsmiths and little gunpowder. In the war’s early days, George Washington estimated there was only enough powder for his troops to fire nine shots each. Meanwhile, Native Americans seemed to have no difficulty making bows and arrows, so how tough could it be? Answer: tougher than you’d think. 6. “[A] man may shoot as truly with a bow as with a common musket.” Here’s Franklin’s fatal error. He was thinking of the longbow, which had been used to deadly effect during the Hundred Years’ War at the battles of Crecy (1346), Poitiers (1356), and Agincourt (1415). The longbow was an English specialty—armies on the Continent used the crossbow, which generally had less range and was much slower to reload. An archer with a crossbow didn’t stand a chance against one with a longbow. Not surprisingly, crossbows were soon replaced by guns. The longbow might have lasted longer, except for one thing: using it effectively required extraordinary strength and skill. The bow, made of tough yew wood, had a draw weight of 80 to well over 100 pounds, something only the strongest modern archers can manage. 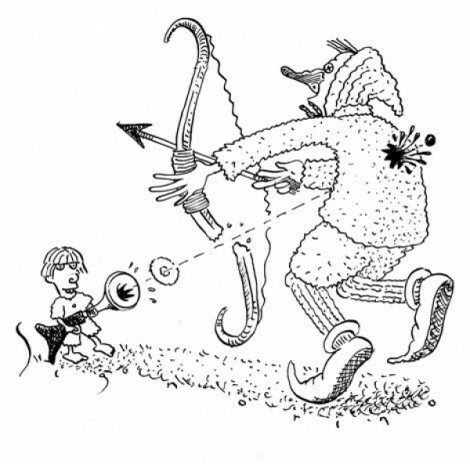 Training took years—English law long mandated that boys take archery practice starting as early as age seven. Fearsome as it was, the longbow didn’t automatically trump the musket the way it had the crossbow. English armies in the 16th century were sometimes defeated despite their longbows, and by the time of the Spanish Armada, the weapon had largely been eclipsed. Other ancient arms still had their uses—the knight’s sword evolved into the cavalryman’s saber and the infantryman’s bayonet, handy in close combat. Not so the longbow. Once the English concluded it wasn’t worth their while to train large numbers of archers, the bow’s usefulness in large-scale combat ceased. By Franklin’s day, it’s doubtful anyone in the colonies knew how to make a longbow or could have used it. The Native American version hadn’t proven especially effective in combat, and Franklin’s evident belief that it could be made otherwise probably had his correspondent rolling his eyes. Guns had the advantage of simplicity: a kid could pick one up and kill somebody with it, a fact that remains apparent to this day.